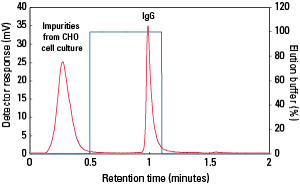 Packed with hydroxylated methacrylic polymer beads, the TSKgel Protein A-5PW column is designed with a high degree of crosslinking, which allows high flow rate for chromatography while still maintaining chromatographic efficiency, peak width and resolution. The recombinant protein A ligand is a code-modified hexamer of the C domain. An enhanced rProtein A ligand is bound to the TSKgel 5PW base bead via multipoint attachment resulting in excellent base stability in 0.1 mol/L NaOH. 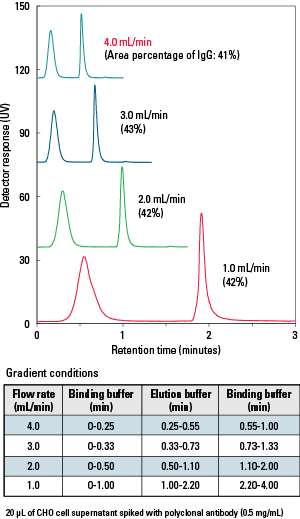 The wide range loading capacity of the TSKgel Protein A-5PW column can accurately determine the titer of mAb at various stages of cell culture media processing. The low level of protein A leaching makes this column a good candidate for small scale purification of mAbs for initial characterization. 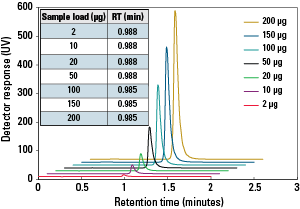 The TSKgel Protein A-5PW column was subjected to a linearity analysis test. Purified IgG was initially injected onto the column with subsequent injections of IgG made at different volumes. The column was then used up to 2,009 injections without being cleaned. A linearity analysis test was then repeated. No significant change in the calibration curve for IgG was seen. The column still maintained its high loading capacity with an excellent linearity (R2=0.9999). 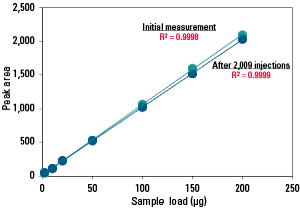 An analysis of an IgG sample was run on both a TSKgel Protein A-5PW, 20 μm, 4.6 mm ID × 3.5 cm column and a similar competitive 20 μm protein A, 4.6 mm ID × 5 cm column. 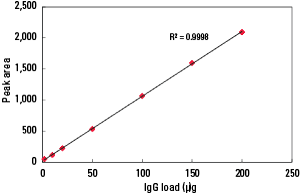 The table shows that the protein A ligand from the TSKgel Protein A-5PW column has 2.3 ppm of Protein A leaching, which is many folds lower than the competitor’s protein A column. This data suggests that the coupling process of protein A onto the TSKgel 5PW base bead is better than its competitor’s coupling process.